Album cover for U. S. issue. The covers for the other Columbia sets were similar. For an example of one of the U. K. covers, see the Columbia Yeomen. This was the fourth and last in a series of abridged sets on the Columbia label. Issued on the less-expensive 10" discs, the series was a direct assault on the popularity of the D'Oyly Carte recordings on the rival HMV label, whose 12" discs could not be played on some equipment. Not to be outdone, HMV came out with their own series of abridged recordings shortly after the first of Columbia's appeared. George Portland, better known as George Baker, sings here under a pseudonym, possibly to avoid offending HMV, with whom he was in effect competing. He had played the Lord Chancellor in HMV's Iolanthe just a year earlier. Francis speculates that some of the other singers may also have been using assumed names. However, Nellie Walker also appeared on many of the HMV sets, but sang here under her own name. There likely was a British issue with drop auto side couplings, but this has not been verified. 1. Iolanthe! From thy dark exile"
2. "Good morrow, good lover!" 3. "None shall part us"
4. "Loudly let the trumpet bray"
6. "Spurn not the nobly born"
7. "When I went to the bar"
8. "When darkly looms the day"
9. "In babyhood upon her lap I lay"
11. "When all night long"
12. Strephon's a member of parliament"
13. "When Britain really ruled the waves"
14. "In vain to us you plead"
16. "Though p'r'aps I may incur your blame"
17. "Love, unrequited, robs me of my rest"
18. "If we're weak enough to tarry"
19. "Soon as we may"
The selections are numbered consecutively from 1 to 19, as shown above. Three of the Columbia sets are similarly numbered, but for The Mikado they used "a" and "b" to distinguish multiple selections on the same side. 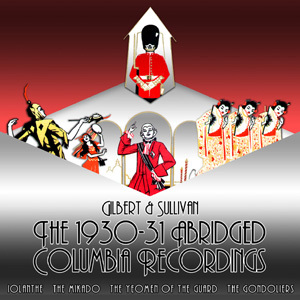 The matrix numbers for the Columbia Iolanthe, Mikado and Yeomen were pre-assigned in the issue sequence of the selections; hence, unlike many of the HMV 78rpm sets, one cannot determine the recording order by sorting the matrix numbers. From the Recording Date column, however, one can see that the company recorded three sides per day on each of two days (8 and 10 June), and the other six sides on 9 June. This observation certainly puts the "take numbers" (a "-1" or "-2" after the base matrix number) in question. If, as these numbers suggest, the first take was published for eight of the sides, and the second take for the remaining four, it should have been possible to record more than 3 sides on 8 and 10 June. 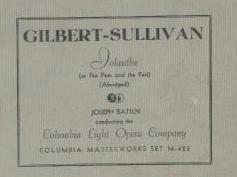 Webster reports that all of the Columbia sets were published in two versions: "laminated records which have a solid gold ring around the label; and shellac records which have the outer gold ring broken at the top by the words 'Made in England', and broken at the bottom by the record company's details." Laminated pressings never included the take number after the base matrix number. Shellac pressings often gave the take number, but not always. As published in England, the Columbia sets (except for The Mikado) did not include side numbers. They are supplied above for ease of reference. James Tappin reports that an American Columbia Iolanthe set that he owns does have side numbers. Francis says that no conductor was indicated in Columbia's daybook for sides 2, 10, and 11. It may, or may not, have been Batten.